Many of these jobs required moving to the Pacific Coast, but Montana did have its own version of “Rosie the Riveter” laboring in the smelters of Anaconda and Great Falls. Working in production and industrial maintenance positions for the first time, these Montana Rosies broke economic and social barriers. Their gains, however, were short-lived. Considered a temporary expedient rather than a permanent workforce, women were quickly pushed out of industry after the war, and their experiences foreshadowed the conservative gender expectations that women encountered in the 1950s. Demand for Montana’s minerals skyrocketed during the war, largely because copper, zinc, manganese, and other Montana-mined minerals were key ingredients in munitions and machinery. As men joined the service, the Anaconda Copper Mining Company struggled to find workers, and as labor shortages became more acute, the federal government pressured the company to employ nontraditional workers, including women. Are you interested in women’s work during wartime? Read Like Father, Like Daughter: Women Who Worked for the Northern Pacific Railroad to learn more about women who found new employment opportunities during World War I. For women’s war time service, read Merle Egan Anderson: Montana’s “Hello Girl” to learn about telephone operators in World War I. For women who served during World War II, read “You Have to Take What They Send You Now Days”: Montana Women’s Service in World War II. Merle Egan Anderson was not the only Montana woman to fight for recognition of women’s military service. Read Doris Brander and the Fight to Honor Women’s Military Service to learn more. Furdell, William J. “Montana Episodes: The Great Falls Home Front during World War II.” Montana The Magazine of Western History 48, no. 4 (Winter 1998), 63-75. Goldin, Claudia. 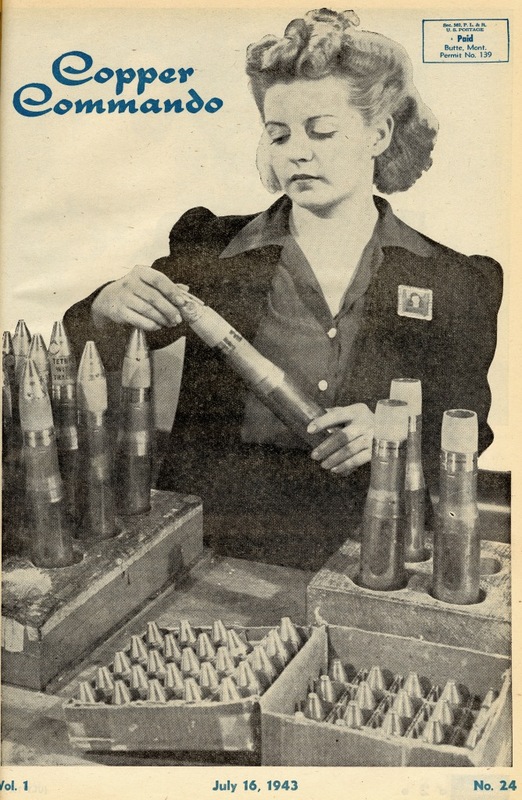 “The Role of World War II in the Rise of Women’s Employment.” American Economic Review 81, no. 4 (September 1991), 741-56. Kossoudji, Sherrie A., and Laura J. Dresser. “Working Class Rosies: Women Industrial Workers during World War II.” Journal of Economic History 52, no. 2 (June 1992), 431-46. Mercier, Laurie. Anaconda: Labor, Community, and Culture in Montana’s Smelter City. Chicago: University of Illinois Press, 2001. _____. “‘The Stacks Dominated Our Lives’: Metals Manufacturing in Four Montana Communities.” Montana The Magazine of Western History 38, no. 2 (Spring 1988), 40-57.